SRF resonators made of high purity bulk niobium are increasingly used in linear particle accelerators. In order to push further on accelerating gradients, a major R&D effort is carried out to increase the performances of superconducting materials. New materials and new processes must be investigated to replace bulk niobium for which theoretical limits are almost reached (53 MV/m @ Bc=200 mT for a single cell cavity ILC-shape). For this purpose, a TE011 test cavity resonating at 3.87 GHz and made of bulk niobium has been developed with a dedicated instrumentation. 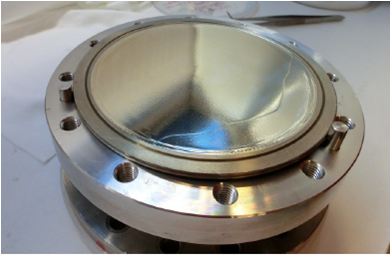 It is devoted to the tests of superconducting sample for RF applications. The system was successfully commissioned in 2010 with bulk niobium samples. An additional development has been achieved for the incident RF coupling system to tune the RF power to the coupling factor of the cavity. A movable coupler has been built and successfully used for surface resistance measurements of niobium samples. First results show that the expected sensitivity of the thermometric method is achieved. In 2012, a first sample with a multi-layer architecture has been tested in collaboration with CEA/Saclay (IRFU and INAC). Promising preliminary results have been obtained.